This week is a little better paced than last week. 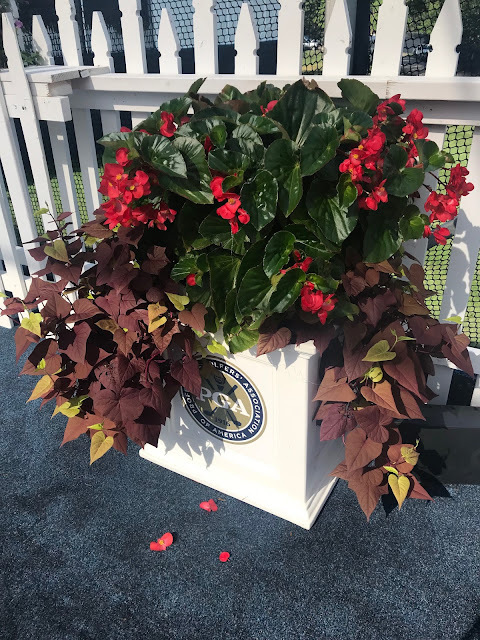 My family and I went to the PGA Championship tournament at the Bellerive Country Club in St. Louis this week. More on this later. We plan to go back on Saturday for the Finals. I organized a fun back-to-school party for some neighbors and had a wonderful time meeting new people and chatting with them. Our book club met and chose a new book. More on that later, too! I love hearing about your upcoming plans and all that you have done this week. We are all busy people but I think one of the best ways to build relationships is to be able to ask questions about our lives. Alli, did you find a new book to read? My friend Kerry remembers the landslide that Cottage by the Sea refers to. That was such a sad event. Amber, did you get some Oui? Let's get started on my Favorites! 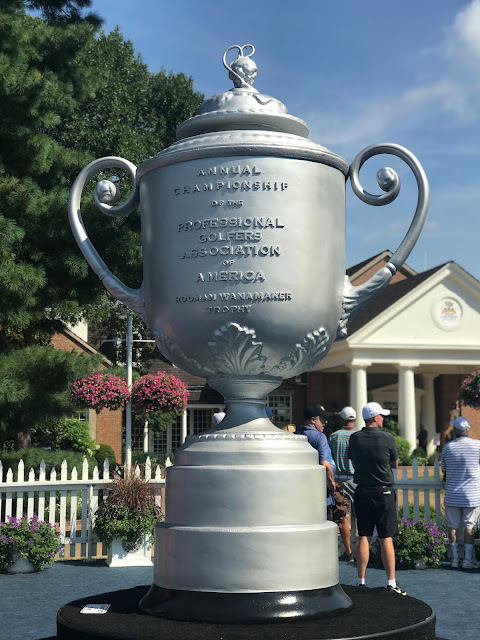 The PGA Championship is being held in St. Louis this weekend, at the gorgeous Bellerive Country Club in Town and Country (a suburban area of St. Louis.) It is an old school, elite country club, one of four such country clubs in St. Louis. The club opened in 1897, and came to its current location in 1959, after selling its location to Normandy School District for an affordable college option for its students. The University of Missouri-St. Louis is on that site now. The tournament is huge and fancy and fun. There are people all over who have a tremendous love of golf. The shop is 50,000 square feet! It was hot, but I stayed in the shade and enjoyed seeing some top golfers, such as Phil Mickelson and Tiger Woods! My book club chose the new book by James Patterson and Bill Clinton. The book is co-authored by the two friends, which made it fun to select. I have just started but I am liking it so far. It is going to be a great book to explain the ins and outs of being the President of the United States. I know I will love that part! I am in love with the scent of this foaming body wash. It is fresh and a bit fruity but not like you are taking a bath in strawberries. I typically don't like fruit smelling washes, but I adore this one. It's around $5 a bottle, and it says you can get 30 showers from the one can. I won't because I love the foam and use more than I need to in the shower! There are only three scents to choose from in this line. 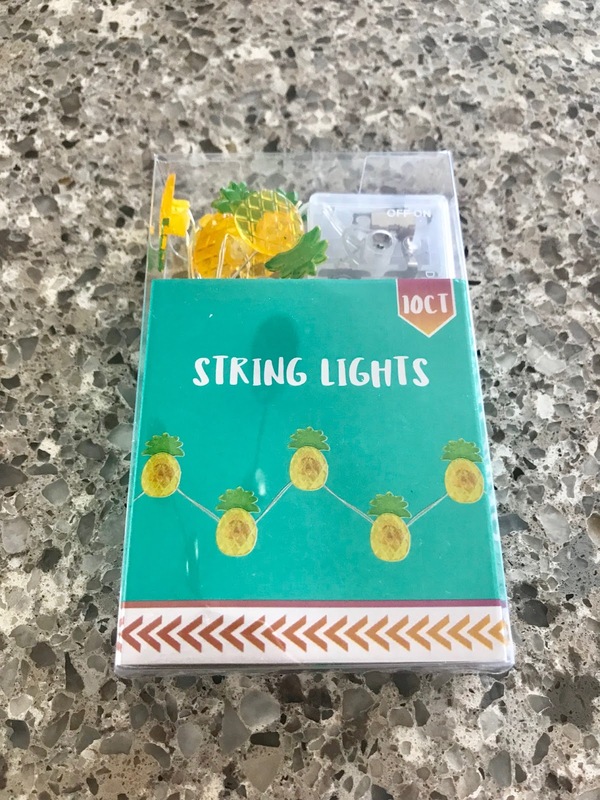 I was in the Dollar Tree store by my home, getting a few things I needed for future recipes, when I saw these adorable pineapple fairy lights at the checkout. The lights are about 3' long with 10 lights, battery operated. So cute that I bought two, one for me and one for my neighbor. I know she will appreciate them! Anyone else into pineapple decor these days? I try to keep it simple, but it is so cute! Enjoy your weekend! We will attend the finals of the PGA Championship on Saturday and on Friday we are going out for a nice meal with the entire family. My husband found a Groupon for 801 Chop House and decided to take out our daughter and her husband. Stay cool if you can!